This land, which was owned by George Washington, and then (eventually) purchased by (early settler) Morris Hudson, who in 1819 built a small church on the knoll that adjoined this property. 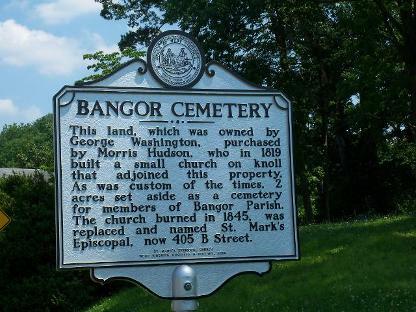 As was the custom of the times, 2 acres were set-aside as a cemetery for members of the Bangor Parish. The church burned in 1845 and was replaced and named St. Mark’s Episcopal, now located on 405 B Street. (Samuel Washington, George's nephew, is buried here. He inherited this property upon his uncle's death). St. Albans along Kanawha Terrace (old US RT 60) at Walnut Street.